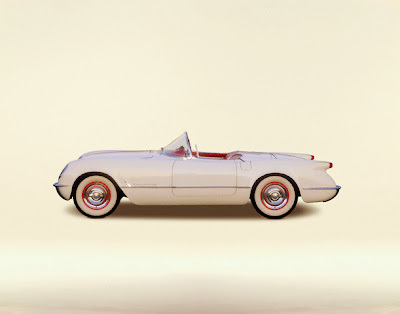 The Corvette made its debut in 1953, and is widely considered "America's Sports Car". Its origins date back to the end of World War II, when returning GIs sang the praises of the lithe sports cars they had seen overseas, such as MGs, Jaguars, and Alfa Romeos. GM designer Harley Earl, always quick to sense a trend, convinced GM to create its own original sports car. Earl chose fiberglass for the body, making Chevrolet the first big company to use the new miracle material in a mass production vehicle. Mechanically, the early 'Vettes used mostly off the shelf components, including a modified "Blue Flame" six cylinder engine. Corvette prototypes made a huge impression at the auto shows, and from this, a legend was born.